The FRAME is a flexible-gadget designed by Hyeong Seop Lee that uses OLED technology to serve many purposes – the FRAME is capable of being a tablet, a laptop, and even a desktop! With a flexible spine running right along the middle, the FRAME can be carried around folded much like a laptop. Open it out completely and you’ve got yourself a pretty big 15-inch tablet that’s great for multi-tasking, browsing, sketching, and watching movies on. 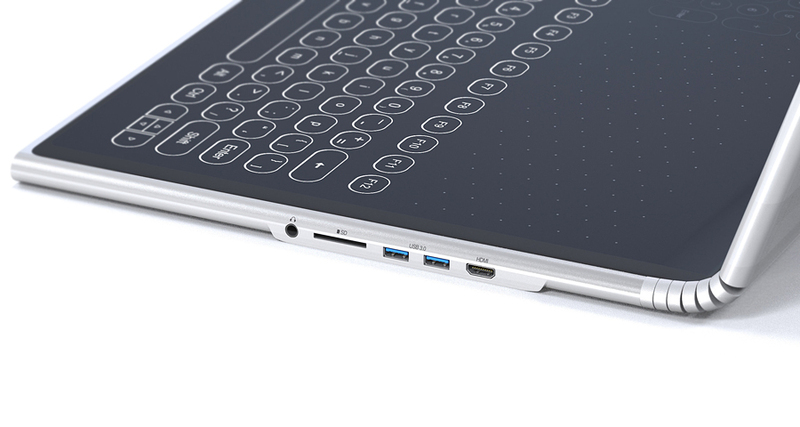 Fold the tablet along its flexible spine and one half of the screen immediately turns into a touchscreen keyboard, giving you the ability to use the FRAME as you would a laptop. In its laptop mode, you can practically angle the display in any way, propping it up vertically just like you would a laptop screen, allowing you to alternate between tablet and laptop whenever you want-need. When you’re looking for more firepower, the FRAME has the ability of becoming your all-in-1 PC. With a dock that allows it to stand vertically (while also supplying power to it), the FRAME becomes your very own desktop, allowing you to connect keyboards, mice, hard-drives, thumb-drives and even the occasional SD card to it (it even packs an audio jack), giving you all the benefits of a desktop in a gadget that also possesses all the merits of a laptop and tablet. With USB and HDMI ports on its side, along with a card-reader and audio jack, the FRAME is a no-holds-barred tablet. Factor in the flexible OLED display and the FRAME becomes a pretty remarkable laptop. Finally add the dock to the mix and the FRAME easily becomes the most versatile desktop in the world, allowing you to carry your data/work/entertainment with you, and giving you the sheer joy of having three completely different products in one singular design. Be sure to check foldable phone from Sumsung and flexible smartphone.